HULTON (LITTLE), a village and a township chapelry in Deane parish, Lancashire. The village stands 2¼ miles WSW of Halshaw-Moor and Farnworth r. station, and 3½ S of Bolton; is a considerable place, inhabited chiefly by weavers and colliers; and has a post office under Bolton. The chapelry is sometimes called Peel. Acres, 1,470. Real property, £18,005; of which £11,084 are in mines, and £86 in quarries. Pop. in 1851, 3,184; in 1861, 3,390. Houses, 670. Peel Hall belongs to Harrison Blair, Esq. ; and Kenyon Peel Hall, to Lord Kenyon. Coal is largely worked. The living is a p. curacy in the diocese of Manchester. Value, £150. Patron, Lord Kenyon. The church is a plain building, with a bell turret. There are a school room used for worship, chapels for Wesleyans and Primitive Methodists, and a national school. Details about the census records, and indexes for Little Hulton. You can also perform a more selective search for churches in the Little Hulton area or see them printed on a map. The Register Office covering the Little Hulton area is Salford. Ask for a calculation of the distance from Little Hulton to another place. "LITTLE HULTON, (or Peel), a chapelry in the parish of Deane, hundred of Salford, county Lancaster, 4 miles S. of Bolton. The village, which is considerable, is chiefly inhabited by weavers and colliers. The living is a perpetual curacy in the diocese of Manchester, value £170. The church, which was consecrated in 1760, is dedicated to St. Paul. In 1835 Little Hulton was a township in the parish of Deane. You can see the administrative areas in which Little Hulton has been placed at times in the past. Select one to see a link to a map of that particular area. A description of Little Hulton in the 19th century. View maps of Little Hulton and places within its boundaries. 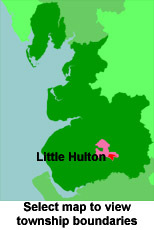 For probate purposes prior to 1858, Little Hulton was in the Archdeaconry of Chester, in the Diocese of Chester. The original Lancashire wills for the Archdeaconry of Chester are held at the Lancashire Record Office.